The life of printed sheet music started in Germany when included in the Mainz psalter in 1457. It has been hooked to paper ever since. Up to now. Sheet music is about to get a new life. A truly digital and social one. 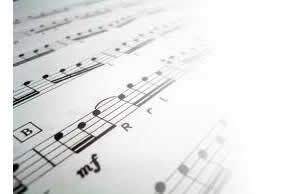 With the free and easy to use music notation software MuseScore, everyone can create beautiful sheet music. While this isn’t a remarkable fact, it’s really just the prerequisite to move sheet music beyond paper. What about sharing sheet music on Facebook? Or making mashups with your sheet music and any YouTube video? Or holding your complete sheet music collection in the palm of you hand with your smartphone or tablet? This all becomes possible with the open source technology MuseScore. Thomas Bonte (Belgium) and Nicolas Froment (France) co-founded a startup together with Werner Schweer (Germany) to drive the future of the leading free & open source notation software MuseScore. The three found each other online and share the same passion for software development & music. Having worked together on the MuseScore project for a couple of years, they first gathered in 2009 in Brussels to discuss the future of the open source project. Later that same year, MuseScore tripled it’s monthly download rate to more than 100.000 downloads per month, which can be mainly attributed to the elevated interest of music education world wide. Two years later, the three formed a startup to develop a sheet music sharing website for MuseScore users with a freemium based business model. The mission is to make the sheet music experience truly digital across the desktop, web and mobile devices.